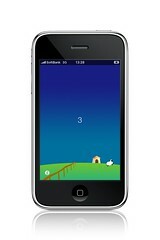 Do iPhone Dream of Electric Sheep? Add gesture to change speed. Draw a circle clockwise to speed up. Draw a circle counterclockwise to speed down. Add black sheep run sometime.